IT Gifts Marketing is one of the pioneers in offering custom made USB flash drives in Malaysia. Raw material used in manufacturing is PVC rubber. PVC rubber is a composite rubber material and it is eco friendly. Our custom made PVC usb pen drive are customized according to design, colours and shape as per the customer requirements. 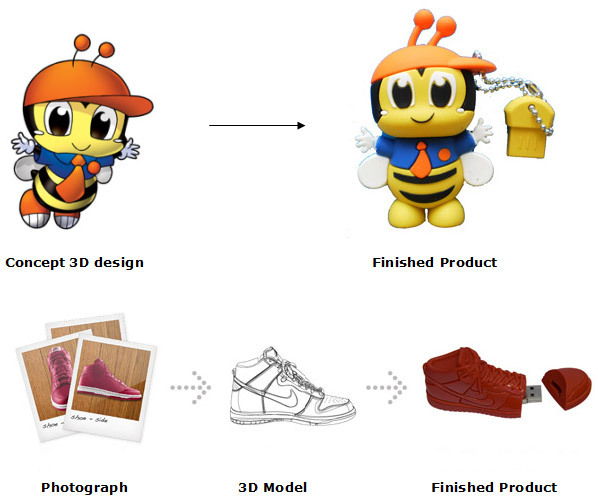 We can create custom-made USB Flash drives from photograph, 3D design, real object or even from sketch. This make the custom PVC pen drives are very unique and attractive as a corporate gifts to clients. Normally, there is no printing on the USB as the logo of the company is to be built into the mould to make the required shape. Minimum order is 200pcs. You may visit this online gifts website if you are looking to purchase for small quantity of carton PVC rubber flash drive.